Carrick Rangers manager Aaron Callaghan knows there is still work to do after his side’s 2-0 win against Coleraine on Saturday. The result moved Carrick to tenth in the league standings and was also the club’s first win of the season in the league at home. Two goals from Daniel Kelly sealed the win against a Coleraine side who huffed and puffed but failed to knock the Carrick defence down. And Callaghan was pleased and relieved after seeing his side pick-up a well deserved three points. “It was a good performance and three points at any level is a good thing and the manner we got the three points was very pleasing. “And we also kept a clean sheet and we have been conceding lots of goal recently. So to win a game, get three points and a clean sheet is very pleasing. “It is good to get a win in the league at home. We had a Cup win against Dungannon but it is great to get that monkey off our back. “We have only lost once in November and it has been a good month for the club and we know we are in a battle to stay in the league. “And we are going to have to produce performances week in, week out to stay up. There are no easy games in this. And Callaghan believes results like Saturday will get people smiling around the club again. “It is great for the players and the fans. The season did not start well and we are trying to give the whole place a lift and the players have been working very hard in training. “We have lifted the tempo in training and the players are getting fitter. Which means they can stay in games longer and that is what we have been doing in the last few games,” he added. And Callaghan said playing Kelly up-front paid off for his side against the misfiring Bannsiders. “I spoke to Daniel and he said he was a striker and I didn’t believe him and I have to see him up there and see what he has. “So he played up there against Dungannon and he did very well but he was not match fit. The home side had started brightly in the first half and ten minutes before the break Carrick took the lead as Kelly headed home from a Lee Chapman corner. It was a good finish from Kelly but where was the Coleraine defence? Coleraine pushed forward trying to get a goal back but their last ball was not good enough to trouble the Carrick defence. It was then 2-0 to Carrick in the 52nd minute as Kelly grabbed his second of the afternoon. 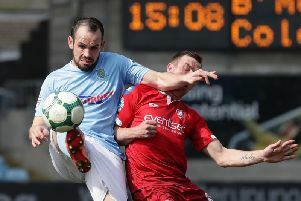 A long ball found the striker, he held off Gareth McConagie before pushing the ball home to give his side a two goal advantage. Kelly had his chance to grab his hat-trick in the 68th minute as he sprinted clear of the Coleraine defence. But just as it seemed the match ball was going home with him, Coleraine keeper Johns made a great save to deny the big forward. Coleraine had a chance through James McLaughlin but his effort was well saved by Neeson in the Carrick goal. And Coleraine manager Oran Kearney was not impressed with his side’s showing as they have been in good form of late. “It was really disappointing and we have been on a great run and things have been going really well but I knew how tough it was going to be down here.